Enter your name and email below to receive Chapter One from my book, Be the Magic of You: Tools to Transform Your Life, completely FREE. I’ll also include the foreword written by Jack Canfield, author of the Chicken Soup for the Soul series. I’ll also send periodic emails containing tools, tips, and content to inspire and motivate you in turning mediocrity into magnificence. I will never share your email with a third party. Teri’s bestselling book, Be the Magic of You: Tools to Transform Your Life, is available in both soft and hardcover. 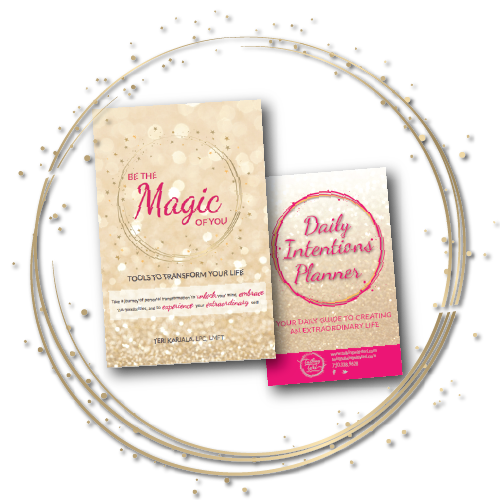 Her Daily Intentions Planner is an incredible tool to for manifesting all you want in your life as well as expressing gratitude and celebrating YOU.